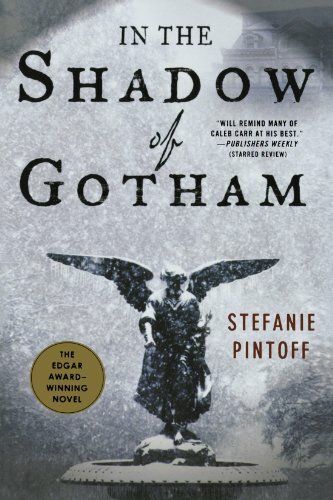 On May 11 2010, the curtain well and truly rose on Stefanie Pintoff’s burgeoning crime fiction career, pulling her out of the shadows and into the limelight. In simultaneously releasing two books—one in paperback, In the Shadow of Gotham, a year after its hardcover release; and the second, A Curtain Falls, in hardcover—she has cemented her place as one of the most promising new American crime writers. She has taken center stage, announcing her arrival as a series novelist, and if her already prodigious output is anything to go by, we can expect to hear a lot more from her in the coming years. Those in the know will be nodding their heads and saying “I told you so”for there’s been nothing quiet about the way Pintoff has started her career. Her first novel, In the Shadow of Gotham, gained rave reviews and boasted no less than Bill Clinton as a fan, going on to win a plethora of awards including the Edgar for Best First Mystery, the Minotaur Books/MWA Best First Crime Novel Award, and a Reviewers Choice Award Nomination for Best First Mystery of 2009 by the Romantic Times Book Reviews magazine. Pintoff calls her brand of historical fiction “a blend of the real and the imagined.” The novels are police procedurals, heavily informed by the real—early forensic and criminology theory and methodology (in a way, the overall series “brand” could be CSI 1906)—but Pintoff’s skill is tobring the cold, hard facts to life through her imagination. This she achieves, with some degree of success, because the novels are moody and evocative, finely written, and generally well paced. Pintoff has already been compared to Caleb Carr, Agatha Christie, and Arthur Conan Doyle. Theodore Dreiser and maybe even John Connolly are, however, perhaps closest in terms of style and overall bleak outlook. In the Shadow of Gotham is the flagship of the series, the mission statement for all that will follow. Right from the start, Pintoff shows her hand by shunning the traditional and more open third-person perspective in favor of the far more claustrophobic first-person point of view, rare for a crime novel. As readers we are very much inside the head of Detective Simon Ziele right from the start. Instead of being allowed to be witnesses to the crime with which the novel begins, we encounter it as he does, knowing what he knows, which is nothing. We are very much in the dark—a fairly apt description of Ziele’s state of mind. Sarah Wingate, an out-of-towner visiting her aunt in Dobson, has been brutally murdered, seemingly for no reason at all. Political pressures mean the case needs to be solved, and quickly but the case appears to be going nowhere; no leads are forthcoming. Until, seemingly out of the blue, Ziele is contacted by the rather enigmatic Alistair Sinclair. Sinclair claims not only to know the identity of the killer, but also why he did it. Which is more than a stroke of luck. Alistair Sinclair is a forward-thinker, an early advocate of studying criminal behavior in order to understand the “personality” of crimes. The dichotomy between Sinclair’s modern ideas of crime and those of the rest of the small-town police force is stark. Through Sinclair, Pintoff is able to highlight the mistrust and downright contempt in which new methods of detecting and preventing crime are held. The early 1900s were a time of great change in thinking about psychology and psychopathology; Sinclair is a man at the bleeding edge, and Ziele, who is already more open to these new techniques than are his colleagues, will eventually follow. Early on, Sinclair asks Ziele: “When you arrest a man for a particularly heinous crime, don’t you often wonder why he did it?” Ziele confesses that he didn’t. But he is a man looking for new ways with which to explain the world and in particular, the horrors that occur within it; and Sinclair’s new ways of thinking about crime have obvious appeal for him. What follows is as much Ziele’s quest to rediscover his own self as it is about the solving of a crime. It is about his emergence from the shadows, from his shell of inertia, until he finally starts to move, to act. To become a more fully rounded character. And the more of a character he becomes, the better he understands the world around him. In the Shadow of Gotham is full of red-herrings, false-starts and cul-de-sacs in the narrative path, but Ziele’s journey is key to the success or failure of Pintoff’s overall vision. In good crime writing it’s all about the chase, and in this case, the Ziele’s dogged pursuit of the villains is an absorbing read. Which is perhaps a good job because the climax of Gotham strikes a rather false note with the rest of the novel, reading like a more recent crime transposed onto the early 1900s. Coming after the excellent period detail of the rest of the book, this is disappointing. Also disappointing is the fact that Pintoff seems to have fallen into the stereotypical crime fiction trap of suddenly, right at the end, beginning to show her villain (or in this case villains) as a bumbling idiot—in one fell swoop destroying her carefully created image of the villain(s) as criminal geniuses. Indeed, so easily does Ziele overcome his foes that it is tempting to question why it was so difficult for him to catch them in the first place. Overall though, these disappointments were far outweighed by the quality of the writing, and it was interesting to read A Curtain Falls immediately after In the Shadow of Gotham to appraise whether Pintoff had addressed her minor flaws. Like, Gotham, A Curtain Falls is a fine piece of work. It’s again a riveting read and again meticulously researched. But overall it does appear, in places, rather more rushed, and less beautifully layered than Gotham. Sometimes it is awkwardly phrased and clichés are allowed to slip in: “allowing him to kill two birds with one stone . . .” and “the man was a loose cannon . . .” being just two examples. One has to wonder whether the release of this second novel was rushed, a case of striking while the iron was hot? Nevertheless, this is again good, solid crime fiction, and could form the all-important steppingstone for the rest of the series. For even more than in Gotham, Ziele is being reclaimed by the city and by the life he rejected. Through the city, he rediscovers his zeal. At first, the name Ziele seemed a strange choice for the protagonist of these novels. After all, he seems to contain little by way of enthusiasm or keenness. When we meet him in Gotham, he’s 30, worn down by tragedy and, frankly, a rather arid narrator.He has an “aversion to blood” and a “weak stomach;” he’s a man who finds it “far easier to deal with the violence of murder when it was reduced to words and facts on paper.” But during Gotham he started to act, and in A Curtain Falls, he finally takes the limelight. He becomes gritter, harder, more like the kind of person a reader could spend an entire series in the company of. A Curtain Falls begins with an Agatha Christie quote: “Crime is terribly revealing. Try and vary your methods as you will, your tastes, your habits, your attitude of mind, and your soul is revealed by your actions.” In this novel crime is not only revealing of the criminal, but also the detective. Through his own efforts to chase down the killer, his own soul is revealed. A Curtain Falls takes place in the world of the New York Theater; a place where the contrast between the wildly successful (Hammerstein for example, who plays a minor role in this novel) and the poverty-line chorus girls couldn’t be more blunt. It is a world wholly unfamiliar to our narrator, and yet Ziele shows far more confidence in entering this world than he ever did in Gotham. He takes responsibility. He cares. Alistair Sinclair also makes a re-appearance in A Curtain Falls, and again he is troubling. In Gotham, he almost provided the biggest narrative cul-de-sac of the lot in the withholding of vital information for the sake of his own criminological research. Here, he is, if anything, even more bizarre. He almost has shades of the Hannibal Lecter about him in his tenacious appreciation of the finer things in life: food, theater and music. And yet at the same time, he is governed by “reasoning and logic,” rather like an early 1900s Spock. The question remains whether Pintoff is capable of sustaining her initial quality of writing over a series, and even whether Ziele and Sinclair are able to support a series. But there is another character in the drama: the city of New York is a character in its own right, and a far more intriguing character than those of Ziele and Sinclair, indeed, it has more character development. It is never static, always changing. Pintoff’s New York in the early 1900s is far more capable of starring in a crime series—and make no bones about it, Pintoff is in it for the long haul—than either Ziele or Sinclair. If there is a true hero of these novels, it is New York. And Pintoff brings it alive through her wonderful sense of place and of history. Meticulous research is Pintoff’s weapon. She offers a razor-sharp historical perspective, and she knows how to use it. Yet at the same time, she can evoke the moody atmosphere of the early 1900s effortlessly. In New York her “blend of the real and the imagined” finds its apotheosis.